Stars: Josh Brolin, Miles Teller, Jennifer Connelly, Jeff Bridges, Taylor Kitsch, James Badge Dale, Alex Russell, Andie MacDowell, Geoff Stults, Thad Luckinbill, Ben Hardy, Scott Haze. There have been a few great films about heroic firefighters, and the best of them is, arguably, Ron Howard’s Backdraft. Other great films about firefighters have included Irwin Allen’s star-studded disaster movie The Towering Inferno and the 1968 Hellfighters, which starred John Wayne as fictitious version of the legendary Red Adair. And while Only The Brave is a moving homage to brave firefighters, it is not quite in the same league. 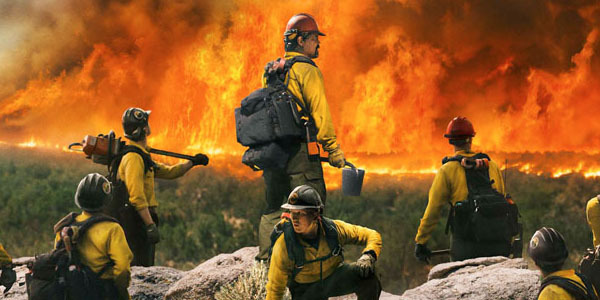 Only The Brave tells the true story of the 19 members of Granite Mountain Hotshots firefighting crew who perished in the notorious Yarnell Hill wildfire of 2013. It was the single biggest loss of firefighters since the terror attacks of September 11, 2001. The film has been inspired by the article No Exit written by Sean Flynn, which appeared in an issue of GQ. The screenplay has been written by Ken Nolan (Blackhawk Down, etc) and Eric Warren Singer (American Hustle, etc), and explores themes of duty, sacrifice, courage, hope, family and community. We are introduced to the Prescott Arizona rural fire brigade, whose job is to clean away debris while the elite squads tackle the blazes head on. However, their leader Eric Marsh (Joss Brolin, from Everest, etc), a tough, driven and no-nonsense individual with an innate ability to read the changes of an out of control fire, desperately wants his crew to be officially recognised as a hotshot crew. Such recognition would enable them to travel to fight wildfires from the frontlines anywhere within the state. Through hard work and rigorous training, they were eventually granted certification as a hotshot crew, the first ever rural crew to be granted such elite status. The film spans some three years and gives us some insight into the rigorous training these elite crews undertake, the discipline, their dedication and the strong sense of camaraderie that they share. Only The Brave is the third feature film from director Joseph Kosinski, whose previous films have been the sci-fi dramas Oblivion and the futuristic Tron: Legacy. His film here is grounded in reality as he pays homage to the brave firefighters, the real-life characters whose selfless actions inspired the drama. Kosinski hails from a background in commercials and he has a great eye for visuals, which serves him well here as he stages some pretty amazing wildfires through a combination of practical effects and state of the art CGI. He takes us into the heart of some awesome conflagrations. Kosinski’s regular cinematographer Claudio Miranda (who won an Oscar for his work on Life Of Pi) uses drones and aerial shots to show us the scale of destruction wrought by these out of control wild fires. Kosinski has assembled a strong ensemble cast to flesh out the main characters. Chief amongst them is Brolin, who is perfectly suited to the role of the rugged macho Marsh, but he tempers the performance with a hint of vulnerability beneath the steely demeanour. And he slowly teases out his backstory, revealing a more flawed character. Jennifer Connelly delivers an emotionally charged performance as Marsh’s wife Amanda, a horse trainer and a strong character in her own right. But she is growing impatient with Marsh and the worry that consumes her every time he is called out to fight fires. And her own troubled backstory slowly emerges. Miles Teller (from Whiplash, etc) is also very good as Brendan McDonough, a local drug addict and bad boy, who finds redemption when he enrols in the local fire brigade in an effort to straighten out his life. He brings conviction to his performance as the bad boy who evolves before our eyes. Jeff Bridges brings his usual gruff manner and craggy weathered features to his role as Duane Steinbrink, the local supervisor and division chief. And he gets to belt out a song during a scene in a bar. Andie MacDowell (Four Weddings And A Funeral, etc) is largely wasted and given little to do as his sympathetic wife. Rounding out the ensemble are Taylor Kitsch as Chris McKenzie, a teammate who initially resents McDonough’s presence but soon comes to respect him; James Badge Dale is solid as Marsh’s second in command Jesse Steed; and Aussie actor Alex Russell (from the recent Jungle, etc) has a small role as crew members Andrew Ashcraft. We come to care about these characters, and the film does have a slightly schmaltzy, manipulative quality to the way it makes us empathise with them. However, the film is a little overlong and sluggish at times. Kosinski’s direction is a little prosaic and the film spends a bit too much time on the bland domestic dramas of the central characters rather than the exciting fire-fighting sequences that give the material its gritty edge. It does fire up though for the moving, harrowing and emotionally devastating finale.